The most common disease affecting the vertebral artery is atherosclerosis. Less commonly, the extracranial vertebral arteries can be affected by pathologic processes including trauma, fibromuscular dysplasia, Takayasu disease, osteophyte compression, dissections, and aneurysms. 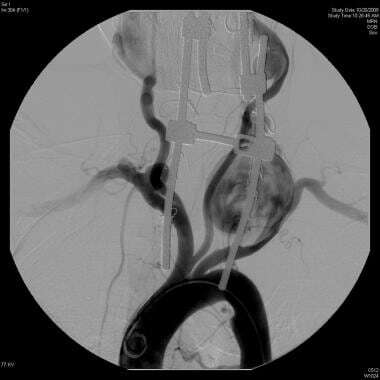 True extracranial aneurysms are virtually always found in the setting of a connective tissue disorder (CTD) whereas false aneurysms may or may not be related to a CTD but usually follow arterial dissection. Crawford and coworkers first described the technique of trans-subclavian endarterectomy of the vertebral artery. Transposition of the proximal vertebral artery to the common carotid was described by Clark and Perry in 1966 through a similar approach. During the 1970s, the saphenous vein was first used to bypass vertebral artery origin stenoses. Eventually, transposition techniques were found to be superior solutions for proximal vertebral disease and have supplanted endarterectomy and bypass as the reconstruction options of choice. Ischemia affecting the temporo-occipital areas of the cerebral hemispheres or segments of the brain stem and cerebellum characteristically produces bilateral symptoms. 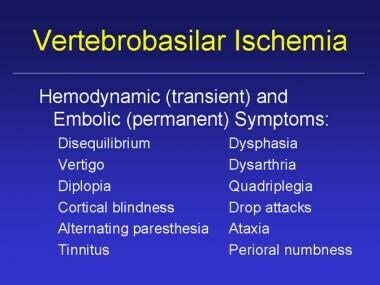 The classic symptoms of vertebrobasilar ischemia are dizziness, vertigo, diplopia, perioral numbness, alternating paresthesia, tinnitus, dysphasia, dysarthria, drop attacks, ataxia, and homonymous hemianopsia. Ischemia affecting the temporo-occipital areas of the cerebral hemispheres and segments of the brainstem and cerebellum characteristically produces bilateral symptoms. See the image below. When patients present with two or more of these symptoms, vertebrobasilar ischemia is likely the cause. Nevertheless, symptoms associated with posterior circulation ischemia are often dismissed as nonspecific findings. Because of the oftentimes vague nature of patient presentation, clinicians may be reluctant to pursue pathologic diagnosis or to recommend treatment for potentially correctable vertebral artery lesions. Numerous medical conditions may cause or mimic vertebrobasilar ischemia, thus confounding the selection of patients in need of posterior circulation treatment. These include inappropriate use of antihypertensive medications, cardiac arrhythmias, anemia, brain tumors, benign vertiginous states, basilar artery migraine, and postsubarachnoid hemorrhage vasospasm. See the image below. 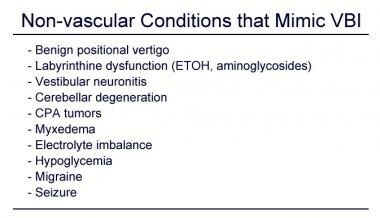 Nonischemic conditions that may mimic vertebrobasilar ischemia. In general, the ischemic mechanisms can be broken down into those that are hemodynamic and those that are embolic. Hemodynamic symptoms occur as a result of transient "end-organ" (brainstem, cerebellum, and/or occipital lobes) hypoperfusion and can be precipitated by postural changes or transient reduction in cardiac output. Ischemia from hemodynamic mechanisms rarely results in tissue infarction. Symptoms from hemodynamic mechanisms tend to be short lived, repetitive, almost predictable and more of a nuisance than a danger. For hemodynamic symptoms to occur in direct relation to the vertebrobasilar arteries, significant occlusive pathology must be present in both of the paired vertebral vessels or in the basilar artery. In addition, compensatory contribution from the carotid circulation via the Circle of Willis must be incomplete. Alternatively, hemodynamic ischemic symptoms may follow proximal subclavian artery occlusion and the syndrome of subclavian/vertebral artery steal (subclavian-vertebral steal phenomenon). In later years of life, vertebral artery stenosis is a common arteriographic finding and dizziness is a common complaint. The presence of both cannot necessarily be assumed to have a cause-effect relationship. Surgical reconstruction is not indicated in an asymptomatic patient with stenotic or occlusive vertebral lesions. 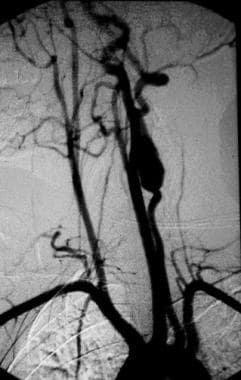 These patients are well compensated, usually from the carotid circulation through the circle of Willis. The minimal anatomic requirement to justify vertebral artery reconstruction for a patient with hemodynamic symptoms is stenosis of more than 60% diameter in both vertebral arteries if both are patent and complete or the same degree of stenosis in the dominant vertebral artery if the opposite vertebral artery is hypoplastic, ends in a posteroinferior cerebellar artery (PICA), or is occluded. A single, normal vertebral artery is sufficient to adequately perfuse the basilar artery, regardless of the patency status of the contralateral vertebral artery. Embolic causes of vertebrobasilar ischemia may not be as well recognized. As many as one third of vertebrobasilar ischemic episodes are caused by distal embolization from plaques or mural lesions of the subclavian, vertebral, and/or basilar arteries. [8, 6] Arterial-to-arterial emboli can arise from atherosclerotic lesions, from intimal defects caused by extrinsic compression or repetitive trauma, and rarely from fibromuscular dysplasia, aneurysms, or dissections. Although fewer patients suffer from embolic phenomena when compared with those with hemodynamic ischemia, actual infarctions in the vertebrobasilar distribution are most often the result of embolic events. Patients with embolic ischemia often develop multiple and multifocal infarcts in the brain stem, cerebellum, and, occasionally, posterior cerebral artery territory. Patient presentation is dissimilar to those with hemodynamic symptoms. Patients who experience emboli have varied presentations. In patients with posterior circulation ischemia secondary to microembolism and appropriate lesions in a vertebral artery, the potential source of the embolus needs to be eliminated regardless of the status of the contralateral vertebral. This cohort is considered candidates for surgical or endoluminal correction of the offending lesion regardless of the condition of the contralateral vertebral artery. With the exception of the patient presenting with a vertebral artery aneurysm, surgical or endovascular intervention is not indicated in asymptomatic patients who harbor suspicious radiographic findings. Atherosclerosis is the primary etiology, although fibromuscular dysplasia (FMD), dissection, compression, and aneurysms can affect the extracranial vertebral artery. The most common disease affecting the vertebral artery is atherosclerosis. Less common pathologic processes include trauma, FMD, Takayasu disease, osteophyte compression, dissections, and aneurysms. See the images below. Selective angiogram of a right vertebral artery pseudoaneurysm. An arteriogram demonstrating aneurysmal degeneration of a left vertebral artery in the V2 segment. True vertebral artery aneurysm (9 cm). Once the diagnosis of vertebrobasilar ischemia has been confirmed with appropriate imaging, surgical correction may be considered. The mere presence of vertebral artery stenosis in an asymptomatic patient is rarely an indication for surgery. Surgical reconstruction is based on the specific etiology. The indication for surgery in patients with hemodynamic symptoms depends on the ability to demonstrate insufficient blood flow to the basilar artery. A single normal-caliber vertebral artery can supply sufficient blood flow into the basilar artery regardless of the status of the contralateral vessel. In this particular subset of patients, surgical intervention is indicated only in the presence of a severely stenotic (>75%) vertebral artery and an equally diseased or occluded contralateral vessel. Surgical reconstruction is not indicated in an asymptomatic patient with the aforementioned radiographic findings because these patients are well compensated from the carotid circulation through the posterior communicating vessels. In contrast, patients with symptomatic vertebrobasilar ischemia due to emboli are candidates for surgical correction of the offending lesion regardless of the condition of the contralateral vertebral artery. As in the hemodynamic group, surgical intervention is not indicated in asymptomatic patients with suggestive radiographic findings. V1: This extends from the origin of the vertebral artery, where it arises from the subclavian artery up to the point at which the artery enters the C6 transverse process. The origin of the vertebral from the subclavian is the most common site for a hemodynamically significant atherosclerotic stenosis. V2: The segment of the artery within the cervical transverse processes (C6-C2) is buried deep within intertransversarium muscle. The V2 segment is the site of a wide variety of disorders. External compression is most likely to occur in this segment because of osteophytes, the edge of the transverse foramina, or the intervertebral joints. Positional changes, such as rotation or extension of the neck, usually trigger compression of the vertebral artery in this segment. The V2 segment is also the most frequent site of true aneurysmal degeneration, fibromuscular diseases, and embolizing atherosclerotic plaques. V3: The extracranial segment between the transverse process of the C2 and the base of the skull where the artery enters the foramen magnum and penetrates the dura matter. This segment is infrequently affected by atherosclerosis but is vulnerable to direct trauma and stretch injuries. V4: The intracranial portion beginning at the atlantooccipital membrane and terminating at the formation of the basilar artery. The V4 segment is devoid of adventitia, as such, open or endovascular interventions in this segment should be approached with extreme caution. Dissections commonly occur at the base of the skull where V3 transitions to V4. This likely occurs because, here, the vertebrae allow for maximal cervical mobility near where the artery loses some of its integrity. The anterior spinal artery arises from branches off each of the vertebral arteries just prior to their convergence to form the basilar artery. Pontine and cerebellar arteries arise from the basilar artery before it bifurcates into the paired posterior cerebral arteries. One vertebral artery may end in a posterior inferior cerebellar artery rather than join the basilar artery. The location of disease will dictate the type of surgical reconstruction that is required. With rare exceptions, most reconstructions of the vertebral artery are performed to treat an origin stenosis (V1 segment) or stenosis, dissection, or occlusion of its intraspinal component (V2 and V3 segments). As discussed previously, a single normal-caliber vertebral artery can supply sufficient blood flow into the basilar artery regardless of the status of the contralateral vessel. In this particular subset of patients, surgical intervention is indicated only in the presence of a severely stenotic (>75%) vertebral artery and an equally diseased or occluded contralateral vessel. Surgical reconstruction is not indicated in an asymptomatic patient with the aforementioned radiographic findings because these patients are well compensated from the carotid circulation through the posterior communicating vessels. Patients with symptomatic vertebrobasilar ischemia who are not amenable to surgery or investigational endoluminal therapy may be treated medically with long-term anticoagulation to prevent thrombosis. Crawford ES, DeBakey ME, Fields WS. Roentgenographic diagnosis and surgical treatment of basilar artery insufficiency. J Am Med Assoc. Oct 4 1958;. 168(5):509-514. Clark K, Perry MO. Carotid vertebral anastomosis: an alternate technic for repair of the subclavian steal syndrome. Ann Surg. 1966 Mar. 163(3):414-6. [Medline]. Berguer R, Andaya LV, Bauer RB. Vertebral artery bypass. Arch Surg. 1976 Sep. 111(9):976-9. [Medline]. Matas R. Traumatisms and Traumatic Aneurisms of the Vertebral Artery and Their Surgical Treatment with the Report of a Cured Case. Ann Surg. 1893 Nov. 18(5):477-521. [Medline]. Henry A. Henry A. Extensile Exposure. London: Churchill Livingstone; 1945. Carney A, Anderson E. Carotid distal vertebral bypass for carotid artery occlusion. Clin Electroencephalogr. 1978. 9:105. Corkill G, French BN, Michas C, Cobb CA 3rd, Mims TJ. External carotid-vertebral artery anastomosis for vertebrobasilar insufficiency. Surg Neurol. 1977 Mar. 7(3):109-15. [Medline]. Rancurel G, Kieffer E, Arzimanglou A. Hemodynamic vertebrobasilar ischemia: Differentiation of hemodynamic and thromboembolic mechanisms. In: erguer R, Caplan LR, eds, Vertebrobasilar Arterial Disease. St. Louis: Quality Medical Publishing, Inc. 1992:40-51. Berguer R, Flynn LM, Kline RA, Caplan L. Surgical reconstruction of the extracranial vertebral artery: management and outcome. J Vasc Surg. 2000 Jan. 31(1 Pt 1):9-18. [Medline]. Berguer R, Kieffer E. Surgery of the Arteries of the Head. New York: Springer-Verlag. 1992. Berguer R, Morasch MD, Kline RA. A review of 100 consecutive reconstructions of the distal vertebral artery for embolic and hemodynamic disease. J Vasc Surg. 1998 May. 27(5):852-9. [Medline]. Caplan L. Posterior circulation ischemia: then, now, and tomorrow. The Thomas Willis Lecture-2000. Stroke. 2000 Aug. 31(8):2011-23. [Medline]. Chastain HD, Campbell MS, Iyer S, et al. Extracranial vertebral artery stent placement: in-hospital and follow-up results. J Neurosurg. 1999 Oct. 91(4):547-52. [Medline]. Cloud GC, Markus HS. Vertebral Artery Stenosis. Curr Treat Options Cardiovasc Med. 2004 Apr. 6(2):121-127. [Medline]. Hauth EA, Gissler HM, Drescher R, et al. Angioplasty or stenting of extra- and intracranial vertebral artery stenoses. Cardiovasc Intervent Radiol. 2004 Jan-Feb. 27(1):51-7. [Medline]. Kieffer E, Praquin B, Chiche L, et al. Distal vertebral artery reconstruction: long-term outcome. J Vasc Surg. 2002 Sep. 36(3):549-54. [Medline]. Berguer R, Higgins R, Nelson R. Noninvasive diagnosis of reversal of vertebral-artery blood flow. N Engl J Med. 1980 Jun 12. 302(24):1349-51. [Medline]. Ruotolo C, Hazan H, Rancurel G, Kieffer E. Dynamic arteriography. 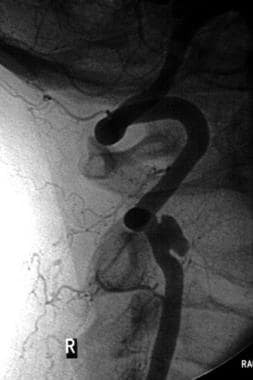 Berguer R, Caplan L. Vertebrobasilar Arterial Disease. St. Louis, MO: Quality Medical; 1992. 116-123. Berguer R. Distal vertebral artery bypass: technique, the "occipital connection," and potential uses. J Vasc Surg. 1985 Jul. 2(4):621-6. [Medline]. Shutze W, Gierman J, McQuade K, Pearl G, Smith B. Treatment of proximal vertebral artery disease. Vascular. 2014 Apr. 22 (2):85-92. [Medline]. Brott TG, Halperin JL, Abbara S, et al. 2011 ASA/ACCF/AHA/AANN/AANS/ACR/ASNR/CNS/SAIP/ SCAI/SIR/SNIS/SVM/SVS guideline on the management of patients with extracranial carotid and vertebral artery disease: executive summary: a report of the American College of Cardiology Foundation/American Heart Association Task Force on Practice Guidelines, and the American Stroke Association, American Association of Neuroscience Nurses, American Association of Neurological Surgeons, American College of Radiology, American Society of Neuroradiolog... Vasc Med. 2011 Feb. 16 (1):35-77. [Medline]. Berguer R. Suboccipital approach to the distal vertebral artery. J Vasc Surg. 1999 Aug. 30(2):344-9. [Medline]. Berguer R. Complex Carotid and Vertebral Revascularizations. Pearce WH, Matsumura JS, Yao JST. Vascular Surgery in the Endovascular Era. Evanston, IL: Greenwood Academic; 2008. 344-352. Stenting of Symptomatic Atherosclerotic Lesions in the Vertebral or Intracranial Arteries (SSYLVIA): study results. Stroke. 2004 Jun. 35(6):1388-92. [Medline]. Jenkins JS, Patel SN, White CJ, Collins TJ, Reilly JP, McMullan PW, et al. Endovascular stenting for vertebral artery stenosis. J Am Coll Cardiol. 2010 Feb 9. 55(6):538-42. [Medline]. Coward LJ, Featherstone RL, Brown MM. Percutaneous transluminal angioplasty and stenting for vertebral artery stenosis. Cochrane Database Syst Rev. 2005 Apr 18. CD000516. [Medline]. Coward LJ, McCabe DJ, Ederle J, Featherstone RL, Clifton A, Brown MM. Long-term outcome after angioplasty and stenting for symptomatic vertebral artery stenosis compared with medical treatment in the Carotid And Vertebral Artery Transluminal Angioplasty Study (CAVATAS): a randomized trial. Stroke. 2007 May. 38(5):1526-30. [Medline]. Ogilvy CS, Yang X, Natarajan SK, Hauck EF, Sun L, Lewis-Mason L. Restenosis rates following vertebral artery origin stenting: does stent type make a difference?. J Invasive Cardiol. 2010 Mar. 22(3):119-24. [Medline]. Steinfort B, Ng PP, Faulder K, Harrington T, Grinnell V, Sorby W. Midterm outcomes of paclitaxel-eluting stents for the treatment of intracranial posterior circulation stenoses. J Neurosurg. 2007 Feb. 106(2):222-5. [Medline]. Vajda Z, Miloslavski E, Güthe T, Fischer S, Albes G, Heuschmid A. Treatment of stenoses of vertebral artery origin using short drug-eluting coronary stents: improved follow-up results. AJNR Am J Neuroradiol. 2009 Oct. 30(9):1653-6. [Medline]. Compter A, van der Worp HB, Schonewille WJ, Vos JA, Algra A, Lo TH. VAST: Vertebral Artery Stenting Trial. Protocol for a randomised safety and feasibility trial. Trials. 2008. 9:65. [Medline]. Compter A, van der Worp HB, Schonewille WJ, Vos JA, Boiten J, Nederkoorn PJ, et al. Stenting versus medical treatment in patients with symptomatic vertebral artery stenosis: a randomised open-label phase 2 trial. Lancet Neurol. 2015 Jun. 14 (6):606-14. [Medline]. Bauer R. Mechanical compression of the vertebral arteries. Berguer R, Bauer R. Vertebrobasilar Arterial Occlusive Disease: Medical and Surgical Management. New York, NY: Raven; 1984. 45-71. Caplan LR, Wityk RJ, Glass TA, Tapia J, Pazdera L, Chang HM, et al. New England Medical Center Posterior Circulation registry. Ann Neurol. 2004 Sep. 56(3):389-98. [Medline]. Roon AJ, Ehrenfeld WK, Cooke PB, Wylie EJ. Vertebral artery reconstruction. Am J Surg. 1979 Jul. 138(1):29-36. [Medline]. Yates PO. Atheromatous lesions of the vertebral arteries and brain infarction. In: Vertebrobasilar Arterial Disease. St. Louis: Quality Medical Publishing, Inc. 1992:3-10. Magnified view of MRI of the brain. The arrow denotes the site of a posterior fossa infarction. Magnetic resonance angiography (MRA) with 3-dimensional reconstruction of the extracranial and intracranial vertebral and carotid arterial system. The arrow denotes the right vertebral artery. Selective angiography of the left subclavian artery demonstrating collateral flow to a patent distal left vertebral artery via the thyrocervical trunk. An arteriogram following a proximal vertebral to carotid artery transposition. Vertebral stent fracture with in-stent restenosis.